The concept of outsourcing isn’t a new one. In fact, outsourcing can be traced back to the Industrial Revolution (1700’s) when companies were looking to reduce labor costs. While outsourcing isn’t a new phenomenon, the outsourced resources have shifted. Today, companies can outsource nearly every component of running a business; but is that the best decision for your company? Asking your in-house managers to assume the full responsibility of site management can be a tall order. While some of the tasks seem easy enough, others require detailed analysis. Removing some of this workload from your in-house team can allow them to focus their resources where they are needed and capitalize on the core competencies of your business. Working with a professionally trained retail site management company can not only provide you with years of expertise, it also has the potential to improve your bottom line. Continue reading to uncover four benefits of outsourcing retail site management. 1. Turnkey programs – From the back office, to the in-store experience and outside sales, building and developing programs that work for your market and customer base can be a complicated task. Allowing an outsourced team with years of experience developing, executing and recapping programs could provide your company with the competitive advantage you’re after. 2. Performance pricing – Regional pricing is a common practice at national accounts, but ensuring you’re not leaving money on the table isn’t as easy as charging a higher average item value in more developed demographic areas. Getting your everyday and promotional pricing/frequency right is more of a science than an art. Turn to the professional to mine the data and provide you with the most efficient use of your space and promotional dollars. 3. Instant on-site expertise – You have a business to run. You may even have multiple businesses to run. Keeping your finger on the pulse of your sites can be a timely endeavor. Utilizing a well-trained and professional retail site management company can afford you the freedom to think of things other than liability exposure, staffing services, administrative support or even vendor negotiations. A top notch outsourced management firm can execute these tasks and more and they can do it efficiently. 4. Potential cost savings – Outsourcing to a site management company could save you money! Companies that choose to use in-house management need to search and hire the appropriate candidates, train them, mentor them and provide them benefits. Outsourcing trained professionals alleviates all of those costly steps. Additionally, your company benefits from having years of expertise working for you. Just because an outsourced company is an additional line item on your expenses, doesn’t mean that they will cost you money. Partner with a quality outsourced site management company to help maximize your ROI. 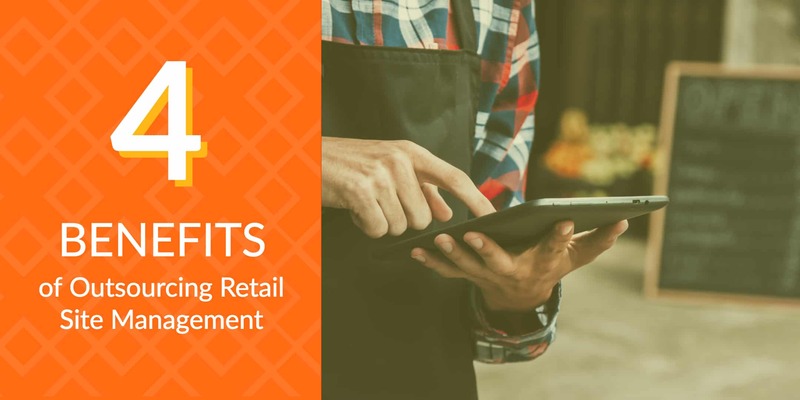 Contact us to learn how StrasGlobal can help you outsource the most critical areas of retail site management and provide you with the peace of mind knowing your business is being managed by the most experienced team in the industry.